For all you Rochestarians, there is a new store near the corner of University and Atlantic, Urban Essentialz. I stopped there last thursday to check it out. They have some cool stuff. I am so happy to see new business in the neighborhood. 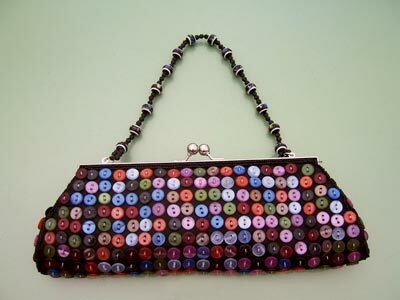 I saw this purse when I was there and thought "I could make that", but when I started thinking about hunting down buttons that were all the same size and style I just bought the purse. Besides... it is supporting local businesses! You lucky Rochestarian ... I love your too-cute new purse! I kept eyeing your purse for the past couple of days and presumed you got it in Toronto - now I have to go check out Urban Essentialz myself. I saw that store on my way to the Clothesline - must stop in. Very cute purse! Weird. I have that purse. I love this place! I bought all sorts of finger puppets. The prices are very reasonable, and they have all sorts of gift ideas for kids up to home decor.